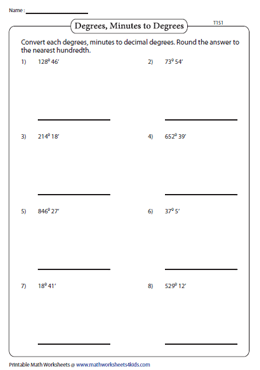 Degrees, minutes and seconds worksheets is a doorway to learn and practice conversion of decimal angles into degrees-minutes or DMS and vice-versa. 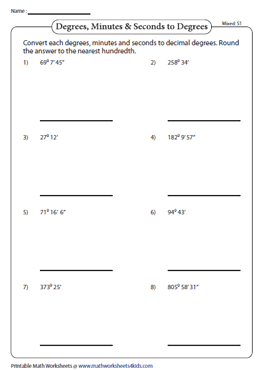 These worksheets are suggested for high-school students. Degrees are divided into 60 equal parts called minutes, similarly minutes are divided into 60 equal parts referred as seconds. 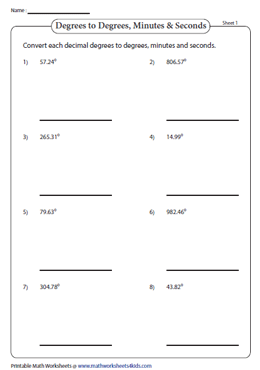 This aggregate of worksheets requires students to change minutes to the decimal degree equivalent by dividing it with 60. Round off the answers to the nearest hundredth. Convert DMS to decimal angles by dividing minutes by 60 and seconds by 3600. 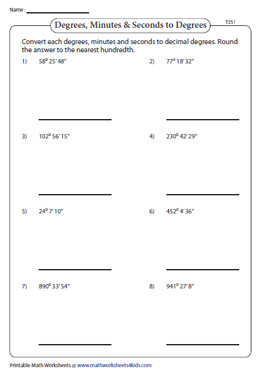 Round off the decimal equivalent to hundredth place value. Recapitulate the concept of converting degrees-minutes and DMS to decimal degrees and then, round off the decimal value to two decimal place. Acquire the degree-minutes value from decimal degrees by multiplying 60 to the decimal part of minutes. 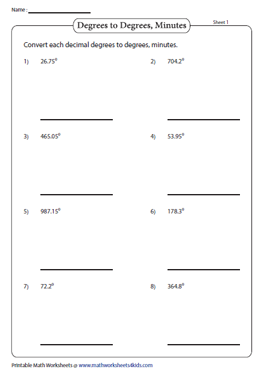 To convert decimal angles to DMS, multiply the decimal part of minutes and seconds by 60.